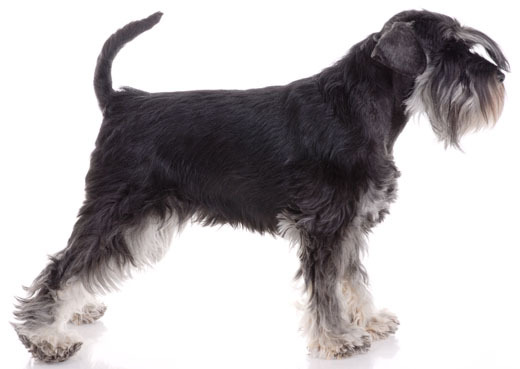 Learn about the temperament and personality of the Miniature Schnauzer. Discover what he's like to live with, his traits and characteristics and how he generally behaves. And look at lots of Miniature Schnauzer photos. The Miniature Schnauzer has the typical terrier temperament: relentless, energetic, brave, alert, curious, scrappy, bossy, and feisty. He's also friendly and willing to please you. Even though he's small in size he's very sturdy and tough. He's quick to argue with other dogs and won't back down from a confrontation (even if the other dog is much bigger and meaner than him!). He's highly intelligent and quick to learn, one of the easiest breeds to train. He loves it when you play with him. His chasing instinct is very strong so he will chase any small creature that catches his eye. He won't put up with abuse from disrespectful children and might snap at them if they tease him. But he's good with respectful children. He gives lots of love to his family and is very affectionate. He wants to participate in all family activities! He will follow you wherever you go and do whatever you do. He loves to sleep with you on your bed. He likes to dig in the yard. He's highly alert and quick to bark at anything out of place, so he makes an excellent watch dog. He's one of the top 20 most popular breeds in the United States. The Miniature Schnauzer is very intelligent and easy to train. He learns new commands very fast. The Miniature Schnauzer sheds practically no hair at all. You'll virtually never find a hair in your home!